AVAILABLE NOW, BRAND NEW CONSTRUCTION, OWNER FINANCING AVAILABLE. 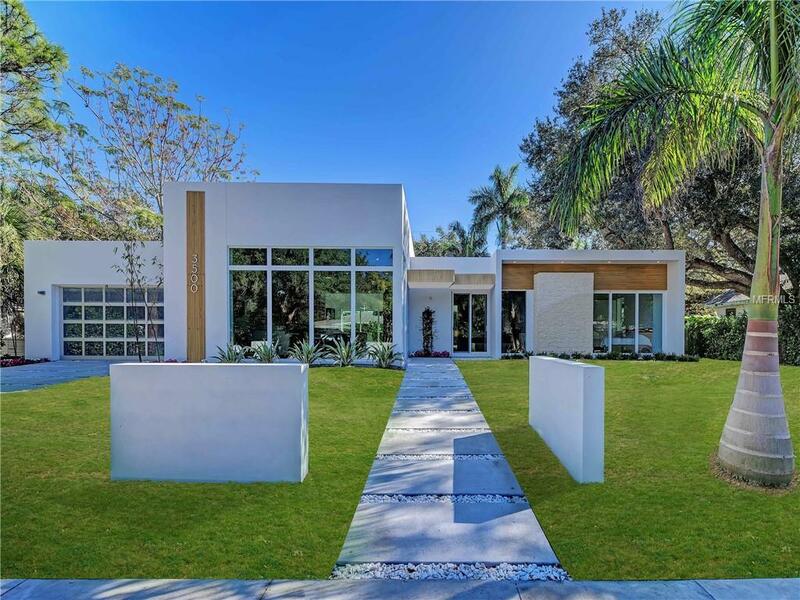 Contemporary design and modern luxury on a large double lot surrounded by vegetation in the highly desirable Indian Beach Sapphire Shore neighborhood. Enjoy spectacular sunsets over the North Sarasota Bay every day which only a 5 min walk away (Nearest water access to view sunsets, launch kayaks, bring dogs, etc.). The property is nearby the famous Ringling Museum and only 2.5 miles away from the heart of Downtown Sarasota and Marina Jacks. Contemporary custom architecture style with an open floor plan, large rooms, natural light, high ceilings and structural engineering to meet or exceed a Design Ultimate Wind Speed of 150 MPH with block walls and impact glazing that removes any hassle of having to install shutters. Step out of any bedrooms through your own sliding glass door to relax in your pool. Install your lounge chair on the large sun shelf or simply relax in the infinite edge overflow spa. House is fully equipped with Lutron Caseta smart lighting system that allows you to control all lights manually with switches, through your smartphone app (Apple HomeKit or Apple Watch) or with voice control through Apple Siri, Amazon Alexa, Google Assistant, etc. Air conditioning system has 4 individual zones that can be set on different temperatures. All windows and glass doors are Energy Efficient with clear Low-E coating. Garage is equipped with a high charging speed Tesla charger. Listing provided courtesy of Prestige Equity Brokers Inc.